mastering to digital and 1/4" magnetic tape"
Our studio system was designed from the ground up to deliver professional level results. There are no lazy choices in the technology here - everything serves a useful and individual purpose. Analogue equipment and magnetic tape handles sound in a way that digital just can't match for warmth - yet digital gives many advantages over solid state equipment, in terms of less downtime, precision editing, long term storage, and instant project recall. Our system is a hybrid analogue/digital system, which combines the winning elements of both. Just check out these specs. If you have any questions, we will be more than happy to explain what all these things mean for you and your music. 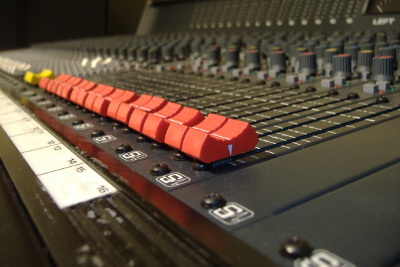 Centre-studio is a lovingly restored Soundcraft S6000 producer's console salvaged from the BBC. The S6000 has 24 main channels with 4band British EQ, 6aux sends, individual 48V pad and phase switching, Penny & Giles smooth as silk long throw faders. It also 16 LED metered busses with 2band EQ, 2aux sends. These combine for 40channel analogue mixdown. We have customised it slightly, adding Sefam VU meters to the master output. Talk to industry professionals about compression and its not too long before Focusrite comes up in the list of desireable purchases. We have a stereo Focusrite Green dual compressor/limiter, which internally is very similar to its famed sibling, the Red 3. This is typically used on the master buss output, but can equally be used during tracking. We also have 2 dedicated Focusrite channel strips, Class A preamps with de-essing circuitry taken from Focusrite's legendary ISA430, and with useful sections adding EQ, expansion, harmonics, compression, tube-sound, and digital conversion. These channels are paired digitally for stereo recording. 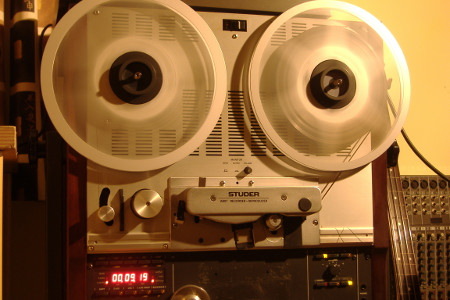 The Studer A807 1/4inch tape recorder was Studer's last word on magnetic tape, and features a very highly engineered tape transport mechanism and Dolby-HX noise reduction. We have 2 of these lovely machines, which we use for bouncing audio during mastering. Magnetic tape does not so much have a generic sound of its own, but each tape formulation has a unique and smooth compression/saturation effect when driven a little harder, which to many ears is superior to the effect you can achieve in digital. Our nearfield monitors are based on uprated Yamaha NS10's, which feature a larger bass driver and individual amps. Our mid-fields are tried and trusted JBL 4410A's ported 3way speakers, powered by a stereo Crown XLS amp. We have Beyer DT100 headphones, and capacity for up to 6 headphone pairs. We have a selection of dynamic and condenser mic's by AKG, Rode, Sennheiser covering vocal, guitar, bass, drumkit and other acoustic instruments, with a choice of signal paths to disk, depending on the project at hand. ProTools HD is THE standard in professional audio recording the world over. Our system is a fully expanded 96channel Avid ProTools HD3 system with 3x PCI-X 32bit DSP cards and fronted by a choice of Avid, RME, and Akai converters. This platform presently provides up to 32channels of simultaneous live recording, so if you are an afficianiado for all live sound, we have you covered. Our ProTools HD3 system runs at version 10.3.10, which is the latest version for 32bit HD systems - while our ProTools ASIO system runs at version 11.3.1. What's the difference? The HD3 version is a 32bit version featuring dedicated DSP chips on PCI cards, boasting a lot of extra processing power for plugins. The ASIO version is 64bit and runs on the 8core Intel I7 chip exclusively, and is able to access a far greater RAM memory range. Which we use depends on the complexity of your arrangement and what kind of processing power is needed. Although we record most of our studio projects in ProTools (x32/x64), we also have versions of Ableton Live 9 (x32/x64) installed for designing and building live sets. Ableton was written expressly for live performance work, so it makes sense that after you have finished your record, you would move to creating samples, loops and phrases suitable to get your show on the road. We have a Launchpad S as well. We are also in a position to create and edit video in Sony Vegas and HitFilm (both x64), which may interest you if you are hoping to create content for YouTube and other video platforms. Audio is just one component in an artist's media collection, but video is a whole new level. If this is of interest, do talk to us about your ideas. It is worth nothing that we have no pirated/cracked or key gen'd software here. We have full licenses for all the software we use, and try to run the latest versions with manufacturer support. We take an active interest in the development of the tools we use and are in regular contact with the software developers involved in the hope that the next generation of software will improve. We have an enviable collection of well over 400 state of the art plugins by leading manufacturers including Ableton, AIR, Avid, BlueCat, Digidesign, EastWest, Dolby, Focusrite, Kush, NativeInstruments, Sony, Synapse, Synthology, Synthogy, ToonTrack and Waves. There are literally too many to mention. The plugins range from dynamic effects like compressors and limiters, many of which are models of the best analogue units ever made, to stunning chorus, delay and reverb effects processors. VSTi plugins account for many of our most used sound sources as well. From samplers like NI's Kontact, through pure synthesis plugins like Synapse's Dune, to orchestral libraries by East West and VSL, to pianos , drums, bass and many more. Our collection of sounds has been greatly expanded through third party libraries, which include a lot of Eastern European and World Music sounds, so you will never be short of unusual sounds to add to your track. We are fans of 7 string guitars, for their extended range and oversized body, which can be really useful when recording acoustically. 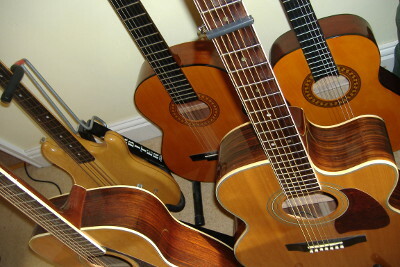 We have 2x 7string Ibanez acoustic guitars, separated in colour and by about 20 years in age. We also have a 24fret PRS 7 string electric, and a heavily customised 22fret Ibanez Gambale FGM100 6 string electric. There is a 3/4 sized Stagg nylon guitar useful for folk and latin performances. When it comes to amps, we have a Fender Mustang, Vox Valvestate and Marshall JMP1 valve preamps. These are backed by modelled amps by NativeInstruments, IKMultimedia, and Waves. This approach gives us a variety of tone stretching from the single coil sixties, classic rock and roll, eighties brittle tones, sultry Les Paul esque tones, sparkling acoustic guitars, country picking, heavy heavy rock wih dropped tunings, and folk music. Many artists like to combine these options with the sounds of their own guitars and amps. We recommend a thorough set up and maintenance cycle BEFORE hitting a session, which at the very least means brand new strings, and fault free electrics. 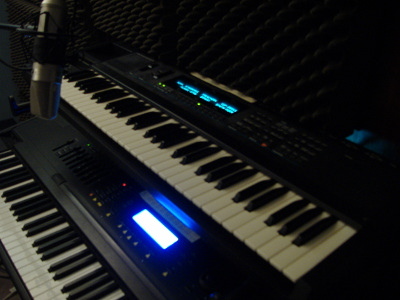 We have a choice of synthesizer keyboards - 2x 88note Kurzweil master keyboards, a K2500XS and a PC3, and a 61note Ensoniq VFX-SD mkII. The Kurzweil PC3 is a state of the art production synthesizer, which has been fully expanded to include the latest sounds, and the Ensoniq is a great example of warm 80's digital, with a breadth of sounds covering ROM samples, wavetable and synthesized waveforms. It's worth stating again that ALL our software is fully licensed and manufacturer supported.